Humphrey Bogart in Casablanca, 1943. Humphrey Bogart is a cinema great. An internationally popular figure, Bogart starred in a string of classic films, which made him a cultural icon, both in his early years, and in his final ones as well. Born to a surgeon father of English decent and an illustrator mother of Dutch decent, Humphrey grew up in comfortable, but somewhat cold, surroundings, which included summers at an estate in Canandaigua, New York, where he and his friends would put on theatricals. He attended the Trinity School in Manhattan and the Phillips Academy in Andover to prepre him for Yale, but he dropped out for reasons which remain cloudy to this day. In 1918, Bogart joined the U.S. Navy, working on bringing back troops from Europe on the USS Leviathan. After the war, Bogart's family was in decline, and he rejected their middle-class life. Boyhood pal Bill Brady, Jr. got Bogart a job writing and directing in a small film company, but he failed at it. Before long, he was making his Broadway stage debut in Alice Brady's play Drifting in 1922. He was awful. Bogart liked the theatrical life, however, what with dames, booze and speakeasies. Bogart never took an acting lesson, preffering to learn by doing. He appeared in many plays on Broadway before the Stock Market Crash in 1929. Moving to Hollywood, Bogart found work, signing a contract at Fox Film, where he palled around with Spencer Tracy; they appeared together in Up the River (released in October, 1930). 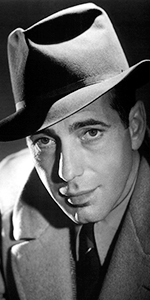 Although Bogart got big supporting roles in films, he shuttled to New York to appear in plays. His father's death in 1934 affected him deeply. Depressed with life and his career, he began to drink heavily. While appearing in Invitation to a Murder on Broadway in the 1934 season, Arthur Hopkins saw that Bogart would be perfect as the bad guy in a play he was producing, The Petrified Forest in the 1935 season. Bogart was a standout in the role of Duke Mantee. Co-star Leslie Howard insisted that Bogart appear with him in the film version of The Petrified Forest (released in February, 1936). Bogart made an big impression and the film a hit, but Warner Bros. cast him in gangster roles in many films on tight schedules — hardly the easy life of an actor he had envisioned. Bogart found himself playing the bad guy in films like Dead End (released in August , 1937), or Angels with Dirty Faces (released in November, 1938); when not at the studio, Bogart bought a fishing boat and spent much of his free time on it. Finally, Bogart's breakthrough film came along with High Sierra (released in January, 1941), thje script for which had been written by John Huston. The two men struck up a life-long friendship. Huston, who wanted to move into directing, got Bogart to star as Sam Spade in his first film: The Maltese Falcon (released in October, 1941). Bogart's "gangster" days were over. Bogart now starred in his most enduring classic: Casablanca (released in January, 1943), which gave moviegoers a chance to see Bogart as a romantic and even heroic figure. The film was a whopping success, bagging the Best Picture Oscar on the stage at the Chinese in 1944. Bogart did his bit on USO tours and Bond drives during World War II, and did voluntary service with the Coast Guard Temporary Reserve. While filming To Have and Have Not (released in January, 1944), the thrice married Bogart co-starred and fell for Lauren Bacall — their relationship became Hollywood legend. The Big Sleep (released in August, 1946), Dark Passage (released in September, 1947) and Key Largo (released in July, 1948) starred both of them as well. Now riding high, Bogart and John Huston teamed together for another of their must-see films, The Treasure of the Sierra Madre (released in January, 1948). The two fought with the studio a good deal, so Bogart quit, setting up his own production company, resulting in films like Knock on Any Door (released in March, 1949), In a Lonely Place (released in June, 1950, Sirocco (released in June, 1951) and Beat the Devil (released in November, 1953). But Huston had chosen to break with Warner Bros. also; his first independent film with Bogart was the outstanding The African Queen with Katherine Hepburn (released in March, 1952, and which played the Chinese in second-run in June, 1952). Both stars got percentages of the profits, making both of them fortunes. Bogart would win the Oscar for his performance in this film. Another great role for Bogart came when playing Captain Queeg in the film adaptation of The Caine Mutiny (released in June, 1954); Bogart's depiction of Queeg's paranoia could not have been done by another actor — Bogart simply melts down on camera. Bogart had a tought time working on Billy Wilder's rom-com, Sabrina (released in October, 1955), but it works, an the film was a hit. Despite failing health, Bogart continued with The Barefoot Contessa (released in September, 1954), We're No Angels (released in July, 1956), The Left Hand of God (released in September, 1955), and The Desperate Hours (released in October, 1955). His final film was The Harder They Fall (released in 1956). Bogart was diagnosed with esophageal cancer in early 1956. Several surgical attempts made to stop the spread of the cancer proved useless. After struggling for a year and wasting away to only 80 pounds, Bogart fell into a coma and passed away in January, 1957, with Lauren Bacall at his side. He was 57 years old. Grauman's Chinese Theatre, Hollywood, California. 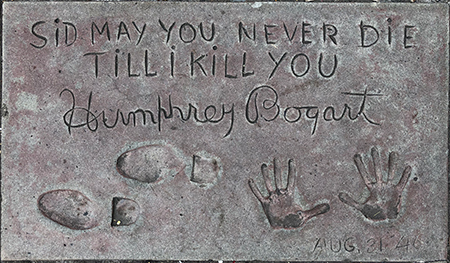 Humphrey Bogart Forecourt ceremony, Wednesday, August 21, 1946. 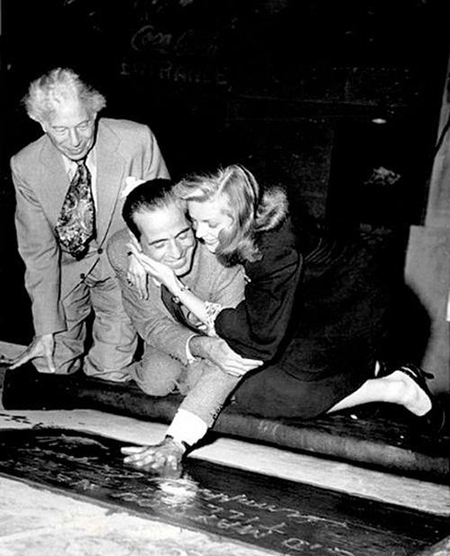 Sid Grauman looks on as Humphrey Bogart makes his hand impression with the help of his wife, Lauren Bacall.